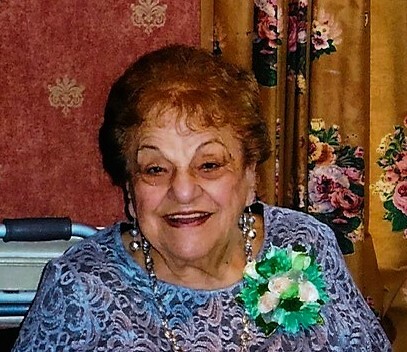 Frances J. Saia, 95, a lifelong resident of South Boston, died November 24, 2018. She was a daughter of the late Anthony and Angela (Embesi) LoPresti, and the devoted wife of the late Joseph A. Saia. Fran was a graduate of South Boston High School, and worked for many years as a Consumer Representative with Gillette Corp. She was a longtime member and secretary for the Sons of Italy, South Boston, was a member of the Castle Island Association, the South Boston Senior Center, and K Club Seniors. She was a member of both St. Gregory’s and St. Brendan’s Seniors, and was a communicant of St. Brigid’s, South Boston. Mother of Joseph A. Saia and his wife Debbie of Burlington, Janice M. Lyons of Wilmington and Gail A. White and her husband Michael of NJ. Sister of Sebastian LoPresti of RI, Joseph LoPresti of Weymouth, Anthony LoPresti of CT, Ann Mooney of Weymouth, Catherine Primavera of Peabody and the late Mary Puchalski and the late Lucy Pellegrini. Grandmother of Matt Saia and his wife Colleen, Laura Saia, Stephen Saia, John Lyons, Michelle White, Ashley White and Rachel White. Relative and friends are cordially invited to attend her funeral Friday November 30th from Hamel Lydon Chapel and Cremation Service, 650 Hancock St, Quincy beginning at 8:30am, followed by a Mass of Christian Burial at 10AM in St. Brigid’s Church, 845 East Broadway, South Boston. Interment to follow at St. Michael’s Cemetery, 500 Canterbury St, Boston. Visiting hours Thursday from 4pm to 7pm at the funeral home. In lieu of flowers, the family requests donations in her memory be made to: American Heart Assn, 300 5th Ave, Waltham, MA 02451.